Kenya Natural History Guide >>> Insects >>> Flies, Mosquitoes and Gnats >>> Flesh Fly? Observed in a maize field at Eldoret, Kitale, Kenya, July 2014. 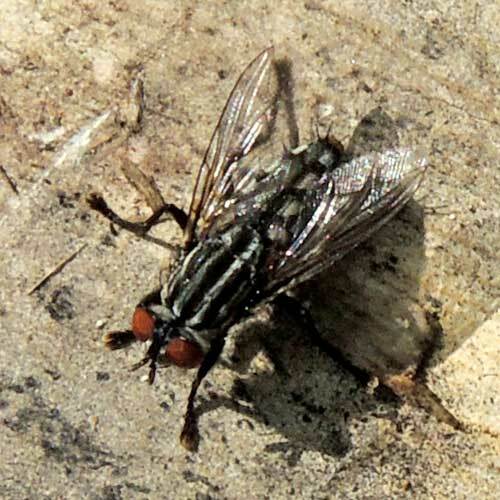 From Wikipedia: Members of the subfamily Sarcophaginae are small to large flies (4-23 mm) with black and gray longitudinal stripes on the thorax and checkering on the abdomen. Other key features include red eyes and a bristled abdomen. Abdominal sternites II and III are free and cover the margins of tergites. The posthumeral bristles are one or two in number, with the outermost pair missing.